New Delhi: After the Metro, the national Capital of Delhi may get the Metrino: Driverless pods suspended midair from wire on a 70 km stretch between Delhi’s Dhaula Kuan and Manesar (Haryana). The plan is to develop this system in the next two-three years. According to sources, the Union Minister of Road, Transport and Highways Nitin Gadkari made a presentation to the Union Cabinet about this new mode of transport on Wednesday evening. The Cabinet members lauded the project, which is likely to decongest traffic on National Highway-8 (NH-8) that currently has the Delhi-Gurgaon Expressway. “The project will be executed and operated by a private player without any investment from the Union government. The minister, in his presentation, said a consultant would be entrusted with the job of preparing a detailed project report (DPR) within six months. The project cost is estimated to be around Rs 4,000 crore and is likely to be completed in two years from the date of award of contract,” said a government official. Gadkari had earlier indicated that the capital cost of the Metrino was Rs 50 crore for a kilometre in contrast to the Metro, which is Rs 350 crore. Besides, the project does not require land. The government plans to provide the central verge to build the pillars. The Metrino system would run on the pattern of a ropeway. It would come down at the station and would be powered on electricity. Each pod will accommodate up to five people. 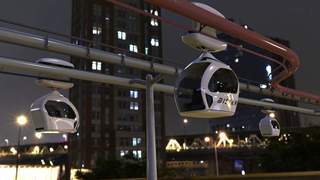 The pods are suspended from an overhead network that is around 5-10 m above ground. Each pod is capable of speeds up to 50 kmph. Under the project, fully automated and driverless pods will travel suspended under an overhead network. Sources added that once a passenger gets into the pod, he/she can select the destination using either a touch panel or voice commands. Rides can take place from any stop directly to the destination selected without a break in journey. Stops are offline like petrol stations along motorways, and hence, don’t obstruct the flow of traffic on guideways. The Metrino system has been tried out in countries like Poland. According to a New Zealand-based Metrino PRT website, Metrino has the capacity of ferrying 6,000 passengers per direction every hour compared to 3,000 for buses and 40,000 for tubes.